Apple periodically releases new versions of its iOS software for iPhones, and many users will eventually install the most current version available for their devices. Each new iOS version brings about some new features and changes, many of which are meant to improve security on the iPhone. 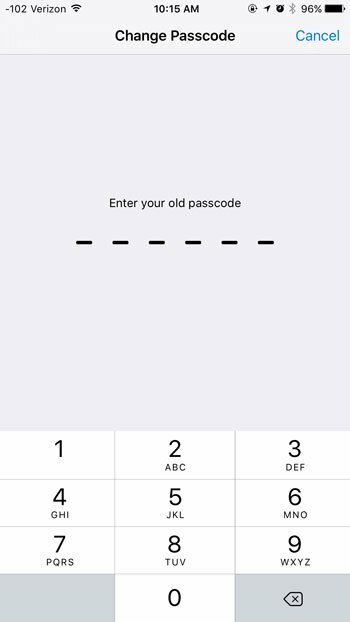 So, after updating to iOS 9, you may have switched from a 4-digit to a 6-digit passcode. It may have initially seemed like this was a new requirement, but you still have the option to use a 4-digit passcode if you would prefer. 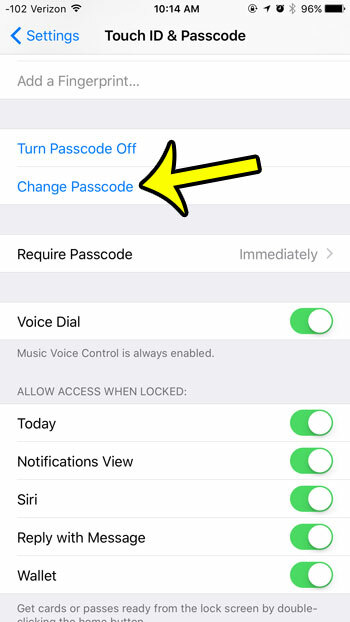 Our guide below will walk you through the process of changing from your current iPhone passcode to the simpler 4-digit passcode that you were likely comfortable and familiar with in earlier versions of iOS. 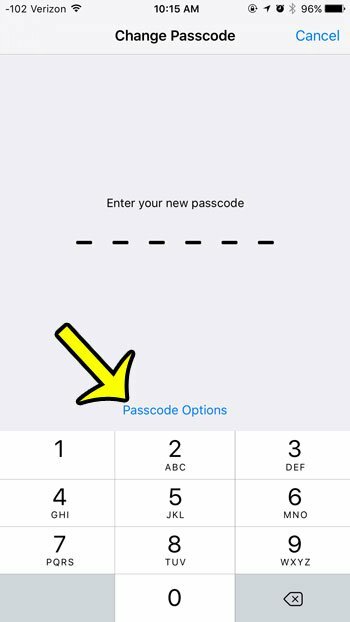 The steps in this article will show you how to change from your current passcode type in iOS 9 to a simpler 4-digit passcode. This passcode type is less secure that one with more digits, but it is easier to enter. 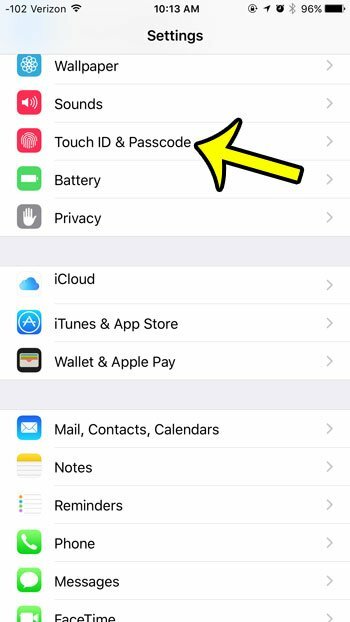 Note that the Touch ID is a separate entity from your passcode. You can turn off your Touch ID on an iPhone 6 if you do not wish to use it. You can also use those same steps to turn it back on if it was previously turned off. Scroll down and select the Touch ID & Passcode option. Scroll down and tap the Change Passcode button. Enter the current passcode again. Tap the blue Passcode Options button. Select the 4-Digit Numeric Code option. Enter the 4 digit passcode that you wish to use. Confirm the new 4 digit passcode. 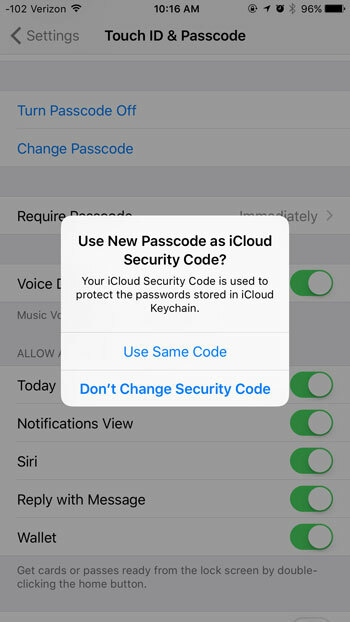 Select whether you would like to use this passcode as your iCloud Security Code. Did you know that your iPhone has a flashlight that you can access without installing any new apps? 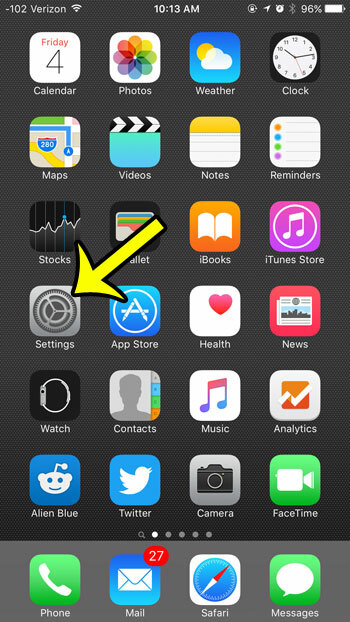 Learn where the flashlight is in iOS 9 and start using this cool, useful feature today.